The brand-new menu item is an otherworldly ode to excess. Starting on Monday, March 26, Red Lobster rolled out a daring new menu item that has inspired unrest, enthusiasm, and uncertainty across the country. 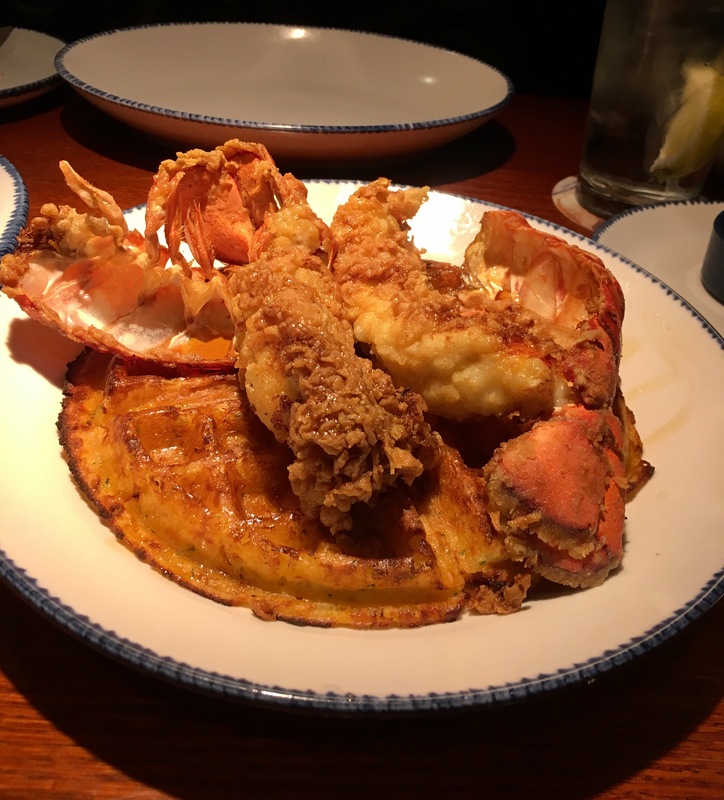 The dish, Fried Lobster and Cheddar Bay Biscuit Waffles, is exactly what it sounds like: a waffle made of their cult-beloved Cheddar Bay biscuit mix, topped with a massive fried lobster tail, all drizzled in maple syrup (and served with side maple syrup, just in case.) The average price is $19.99, but varies by market. As a Red Lobster scholar who is always looking for an excuse to bail on yoga, I had a moral obligation to try the dish. After tuning out the social media buzz on Monday so as not to corrupt my flavor experience with expectations, I rushed to the Times Square Red Lobster to meet friend and writer Dan Piepenbring to share the dish for dinner. And it tasted just as extreme as it sounded. "It was sort of like eating the Martian equivalent of chicken and waffles, right down to the orange, slightly ferric appearance of the cheddar waffle, with the lobster shell laid over it like an alien fossil," Piepenbring said. "And it tastes kind of alien, too, in a pleasant way. The cheddar changes everything." Indeed, plopping deep-fried lobster on a savory, crispy, cheddar-forward waffle is an otherworldly move, one that feels like it could end in death. But it didn't, to its credit. I found myself picking away at my sweet-salty half until it was all gone, then binging on the side of green beans in a futile attempt to offset the richness and maybe absorb some nutrients, for which my body was screaming. The split Maine lobster tail, buttermilk-battered and fried, is succulent and crisp, and pairs quite nicely with the crispified Cheddar Bay base, though the dish could have used less of the maple syrup, which is too intense and too sweet to cover every morsel so liberally. Our waiter likened the waffle to a scallion pancake, what with the crispiness and saltiness and greasiness (which was delightful), but I wish the onion flavor in the batter had been more pronounced; the maple drowned out much of the Cheddar Bay waffle's (we'll say it) subtlety. "I think it's best without too much syrup," Piepenbring agreed. "Better to let the savory flavors do the heavy lifting." The experience of eating deep-fried lobster on a grease-bomb waffle was fun, I'll say it. The unfathomably rich dish hit all my pleasure points and, for a brief moment, made me feel like I lived in a utopian universe where I never felt pressure to do yoga and all dishes had a Cheddar Bay component. "It made me feel deeply, almost excessively, comforted, as it embraced by the most sensitive lobsterman in Maine," my dining companion said. That night, I slept for ten beautiful, uninterrupted hours. I awoke the next morning uncomfortably full, but at peace.